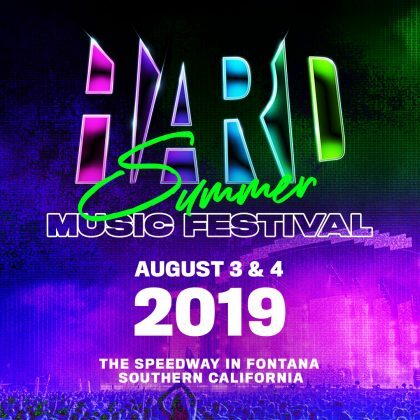 Looking for the easiest and best way to get to the Speedway for the festival? 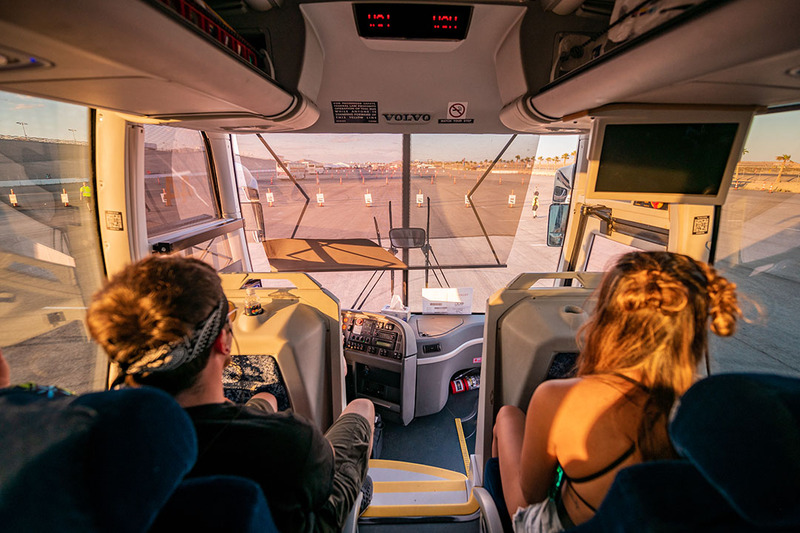 EDC Las Vegas Shuttles are the only official shuttle option available with direct access to the festival gates, using a dedicated route to bypass regular traffic and taking you to a special lot directly adjacent to the festival site. The EDC Shuttle program offers security pre-check, a dedicated customer support team, and restrooms and water at every stop. 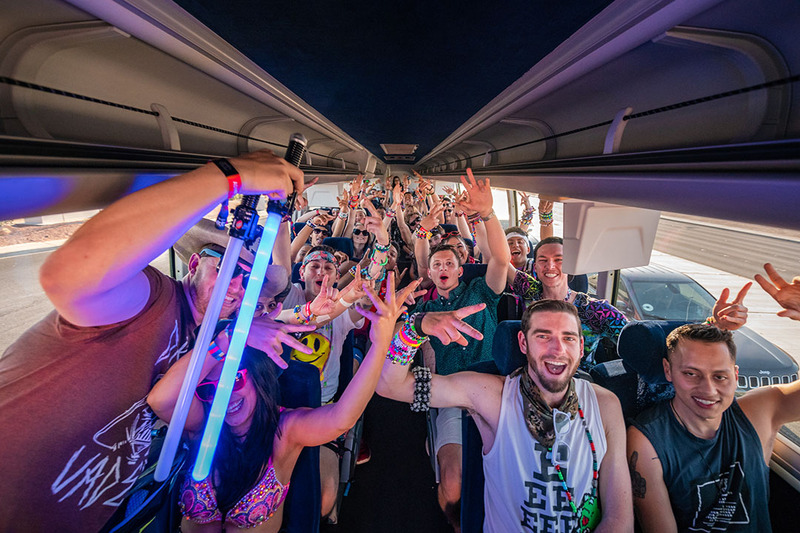 Standard Shuttle passes include 3-day round-trip transportation to and from EDC Las Vegas. Standard Shuttles depart and return on a convenient ongoing basis throughout the day. Departure Times: Shuttles will operate continuously from 6:00–11:30pm from all standard stops. Return Times: Outbound shuttles will begin at 3am and conclude 60 minutes after the music ends at kineticFIELD. With a Premier Shuttle Pass, you can reserve your shuttle departure times to and from the festival each day and will receive a premier merchandise pack with festival essentials. You will choose your shuttle departure time and your return time from EDC Las Vegas as one round-trip ticket. Heading to the festival grounds early for the Opening Ceremonies? Hop aboard the Opening Ceremony shuttle at the Festival Grounds at Circus Circus from 3–6pm on Friday only. This option is available as an add-on during the purchase process for all shuttle pass holders. Premier riders will have access to expedited loading from the Festival Grounds at Circus Circus. What Standard Shuttle stop locations can I choose from? Can I ride from any Standard Shuttle stop with my Standard pass? How often will the Standard Shuttles run? Standard Shuttles will depart continuously from 6:00pm–11:30pm. Return service from EDC back to your stop will begin at 3:00am and conclude 60 minutes after the music ends at Kinetic Field. What Premier Shuttle stop locations can I choose from? What times will the Premier Shuttles run? 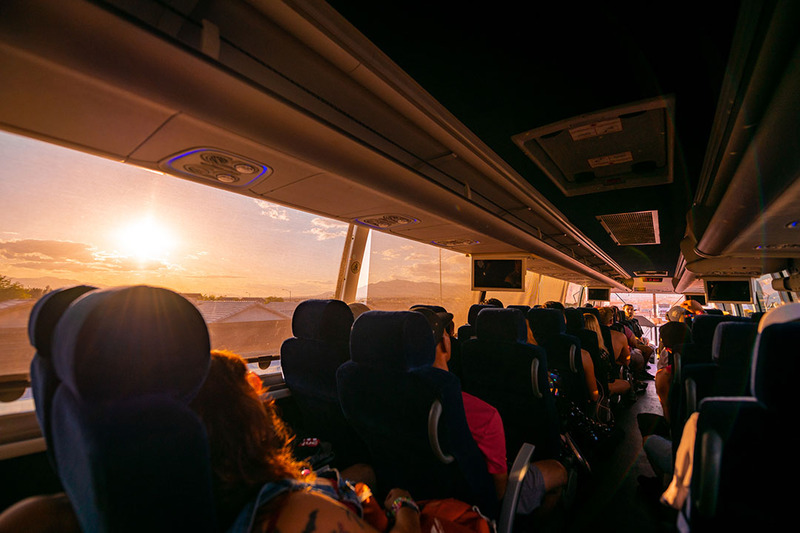 At checkout, you will have the option to reserve the following Premier Shuttle departure and return times (availability permitting): Please note, your departure and return time will be the same for all three days of EDC. If I have a Premier Shuttle Pass, can I ride the shuttle at any time, leaving from any stop? Each Premier Shuttle Pass is valid for a specific Premier Shuttle stop at a reserved time and cannot be used at any other Premier stop or at an alternate time. 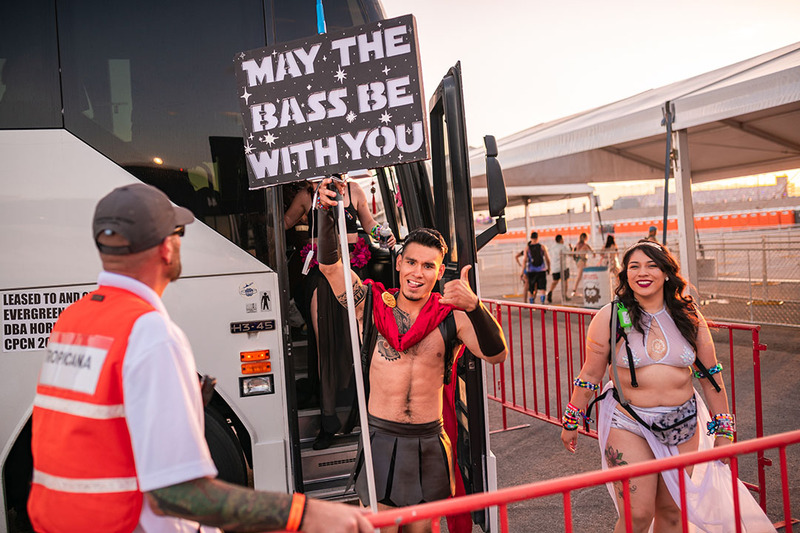 If you miss your reserved time you we will honor your pass at any official Standard EDC Shuttle location (note: Standard Shuttle stops will NOT feature merchandise pickup). Will there be a fast-pass lane for VIP ticket holders at the standard shuttle stops? 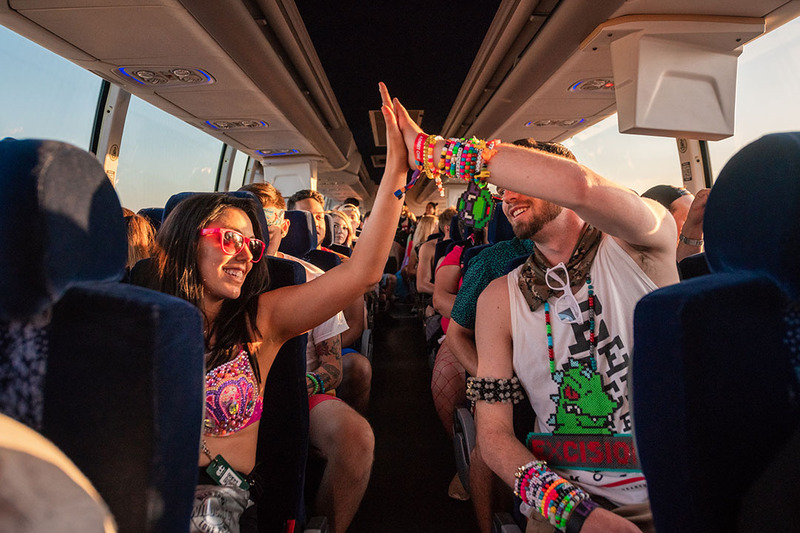 All standard shuttle stops heading to EDC will feature a fast-pass lane for VIP ticket and Premier Shuttle pass holders. Can I purchase an official shuttle pass from anywhere other than this website? The only place to purchase an official EDC Las Vegas Shuttle Pass is through the official EDC Las Vegas website. Note: This is the official Shuttle Program of EDC Las Vegas, and we do not oversee any independently offered shuttle programs. Only the official EDC Shuttles will have access to the Speedway and optimized routes to get you there even faster. 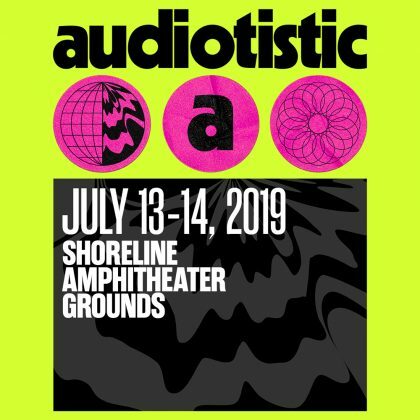 Third-party services are not endorsed and will not have access to the event grounds. Can I ride the shuttles to the Opening Ceremony on Friday? Yes! On Friday, the cosmicMEADOW gates will open at 3pm, followed by a pre-party & Opening Ceremonies from 4–7pm. All shuttle pass holders looking to attend the Opening Ceremonies can RSVP for early shuttles leaving from the Festival Grounds at Circus Circus—running from 3–6pm—for a small additional cost of $5. All Shuttle Pass holders, regardless of shuttle location, are able to add this option, but you must go to the Festival Grounds at Circus Circus to catch the Opening Ceremony shuttle. Please note: Opening Ceremony passes are limited and may sell out. How long will it take to get to the festival? We cannot accurately predict the exact traffic on the day of the festival, but our experienced dispatch team will have thoroughly vetted routes and do everything in their power to circumnavigate festival traffic to get you to the party as quickly as possible! Is it possible to change the time or location of my shuttle pass? While we can’t make any promises, you can reach out to the EDC Las Vegas Shuttle Support Team through our contact form or 888-334-4496, and they can look into your options. Please have ready your order number, shuttle stop, and desired shuttle stop—and/or time slot purchased and desired time, if you have a Premier Pass. How far is the shuttle drop-off from the festival entrance? The shuttle drop-off is directly outside the festival entrance in the Red Lot. How will I know what shuttle to take at the end of the night? All shuttles will be clearly labeled, and EDC Las Vegas Shuttle Support Team members will be available to direct you to the correct loading area. If I lose my shuttle pass, can I get it reissued? Once you receive your shuttle pass in the mail, please keep it safe. If you lose your shuttle pass, please visit one of our box offices at the shuttle departure location. We will be able to void your original pass and issue a new one for a $20 replacement fee, as long as you present proper photo identification and the credit card used to purchase. Please note: We can replace shuttle passes only once. If you lose your shuttle pass twice, we will not be able to reissue it a second time. 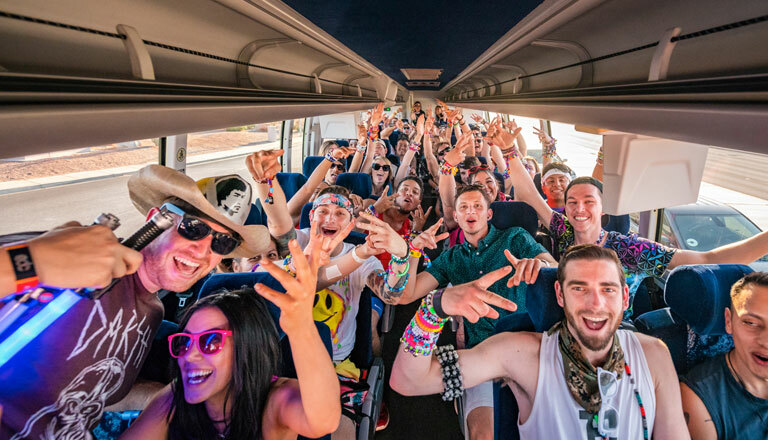 Can I buy a shuttle pass at one of the shuttle stops or on-site at the festival? Our shuttle passes will most likely be sold out by the time of the event. We encourage you to purchase your passes early. Will there be restrooms on the shuttles? While we are unable to guarantee restrooms on every shuttle, there will be restrooms at all shuttle stops and upon arrival at EDC. Are there items I am not allowed to bring onto the shuttles? 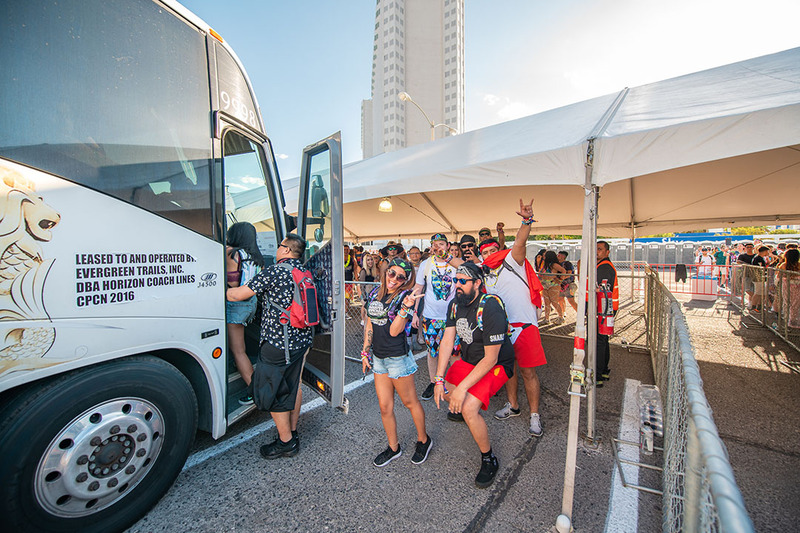 There will be a security pre-check at all shuttle stops, and any items that are prohibited inside the festival are prohibited on the shuttles, including outside food and drink. Be sure to thoroughly review the list of acceptable and prohibited items. I don’t need my shuttle pass anymore. Can my friend use it? It is perfectly fine to give your shuttle pass to a friend. However, if they lose it, they will need a photocopy of your ID and credit card used to purchase in order to have the pass reissued for the $20 replacement fee. We recommend you give this information to them in advance. Can I use my EDC Las Vegas Shuttle purchase for a contest/giveaway or to promote my website/product/event? No. 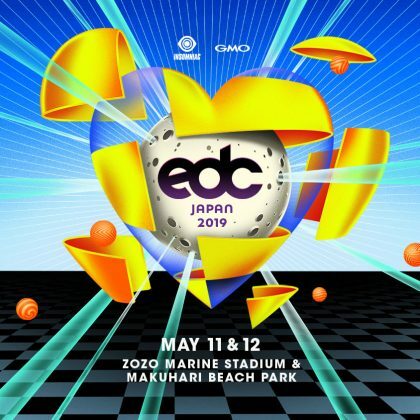 EDC Las Vegas trademarks, intellectual property, tickets, and other offerings may NOT be used for advertising, promotions, auctions, contests, sweepstakes, or any commercial purpose, without express written consent from EDC and its partners. Our EDC Las Vegas Shuttle Support Team is available from 7am–3pm PT, seven days a week. You can reach us through our contact form or 888-334-4496.